Gili was in the mood for an Ameritrash game. Seeing as it looked like we were going to have good attendance, Gili opted to host the one, long game at her apt. That gave us, for the first time, a JSGC East (my apt) and a JSGC West (Gili’s apt). Gili writes that they only accomplished the first goal but they had fun.. Time ran out. David arrived early to play this with me. I continued my winning streak. I played BRW with some flying and creature control. Not a bad draft. David also played three colors. I’m pretty sure that each of us lost games to bad mana draws, but I think my deck was still a bit more agile than his. New to both, Shneur was Mr. Jack. I taught this to David C and Nati, and we played one hand for practice. David K called and made tichu and then I went out second. Hopefully we can try this again. First play for Shneuer and Francis. Nadine was slightly ahead after the first scoring. Francis had a lot of money (89) by the last round. Nadine and Shneuer were tied, even according to the two suggested tie-breakers. First play for everyone but me; actually second play for David C, but he had only played the introductory game, without minor improvements and professions (it’s much different with them). I explained the rules and the basic strategies, and invited them all to gang up on me, as much as possible. Some of us had dramatically good professions or minor improvements, but even the less dramatic ones made a lot of difference. For instance, David had what looked like a powerful professions “you can plow whenever anyone else plows”, but I got more use out of my profession “+1 clay every time you take either wood or clay”. Nati took the burgeoning food spaces often, which is often a sign of poor production, but he he still did pretty well. In the end, I was the only one with five family members, and I had – by far – the most bonus points in improvements. That was more than enough to make up for my lack of plowed fields and three empty farm spaces. Nadine writes: I had really bad luck. I got the Plague of Locusts twice, once right after having played six castors. David traded strategically several times at the end and got what he needed. Gili brought this, she got it as a free gift with a game she bought at the bgg.con flea market last year. It has similarities to Modern Art and Reef Encouter, good for a light filler. Pretty cards and pictures. Gili got this last year at bgg.con. You have a deck like in Dominion, but there are lot more types of actions you can take. First player to get 7 points wins. I was very lucky. I picked mission cards because I ended up on that statue, but it’s good to get them early. There aren’t too many 4 point ones, I picked a 4 point one and a 2 point one, keep as many cards as you want out of three. You lose the point value of unfulfilled mission cards. Then the two item cards I bought, picking two out of three, had the matching items for the missions. Later I realized that I could reuse items, I had picked up one I needed, so I just needed one more, and to get to the locations, which were handily next to each other. We played a few things wrong though. Lior didn’t realize that flying was a free action, so he lost two actions during the game, and I stored a card I shouldn’t have, the game would have been closer. Lior was close to fulfilling his 3 point mission and another one. We knew but forgot that you could substitute two of the same items for one. The game is fun and interesting, and has an advanced deck we didn’t use. It still seems like luck matters a lot, hard to know yet. I didn’t even get one set. We’re getting better at playing correctly, but we still played wrong and corrected during the game, you have to play a minimum of two cards. We discovered that when you replace the harvest, the original and new ones cause harvesting. Lior caught on well and liked the game, though at the beginning he got a lot of ‘You can’t do that’. Well, pioneers actually. We had two tourists from northern England who are leaving tomorrow morning, Rich and Kate. We were going to play Love Letter but had too many people before we started. New to Rich and Kate who did well, way better than me. They didn’t dump so got a bonus. We played random chips. First play for Rich and Avi. They both caught on well after one round, but Rich didn’t have large enough areas to support his four workers so he was short cubes for feeding. He ended with two neighborly helps for -4 from a respectable 22 points. Avi got the bonus for coins, and sold a lot of cubes, and he had a shed. I didn’t sell as often, but it was earlier in the game, and I drew higher coins. So I had 2 silvers and 2 golds for 6, he had 4 silvers and 1 copper for 4, plus his bonus of 5, but I had a bonus of 3 for buildings. So with a switch of one coin he would have won, so he didn’t like that element of luck. 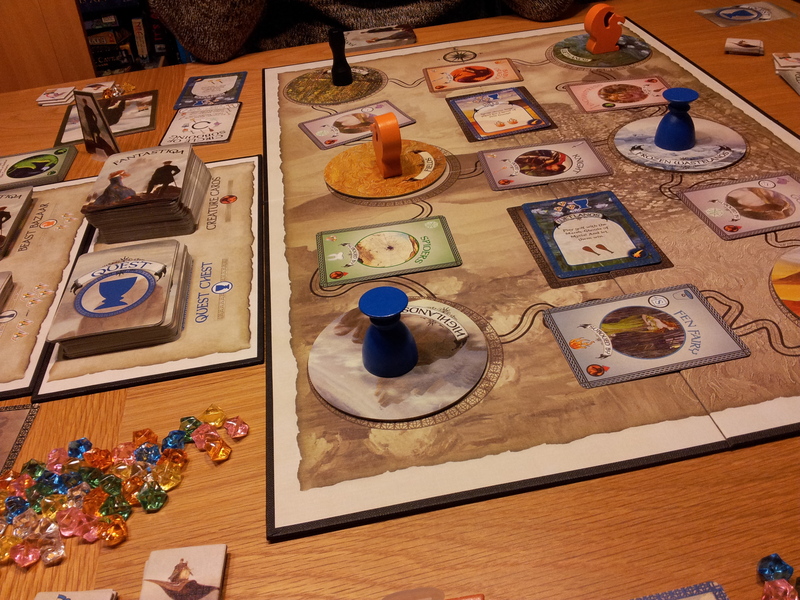 First play for Kate, and Eszter who’s been wanting to play this. 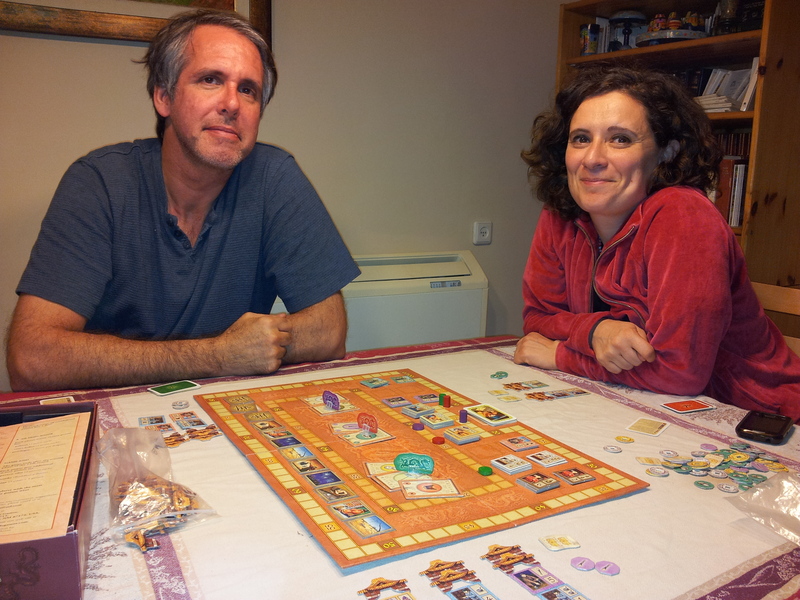 At first Gili’s score was 51 and we though Eszter won, until David recalculated her end game options. They did correct a few rules as they went along. I ended with 2 sets +3, the others with 1 set, +8 for Avi, +4 for Rich. New to both of them. First time I’ve played almost right, with players taking advantage of the trading. 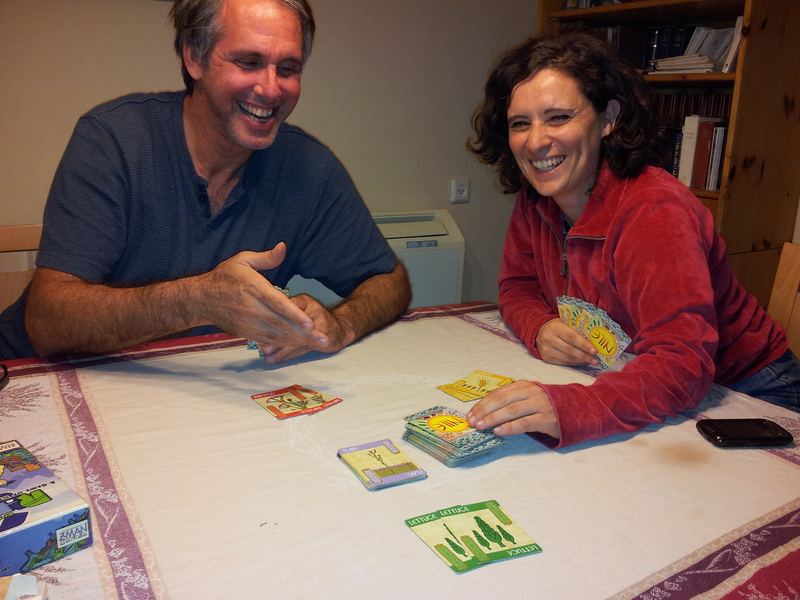 We had to correct the planting a bit after I checked the rules partway through the game. Rich, Avi and I played a bit, Rich was very familiar with the game and cards, new to Avi who really liked it. We played twice more, me, Avi and David. It is fun with deduction and luck. 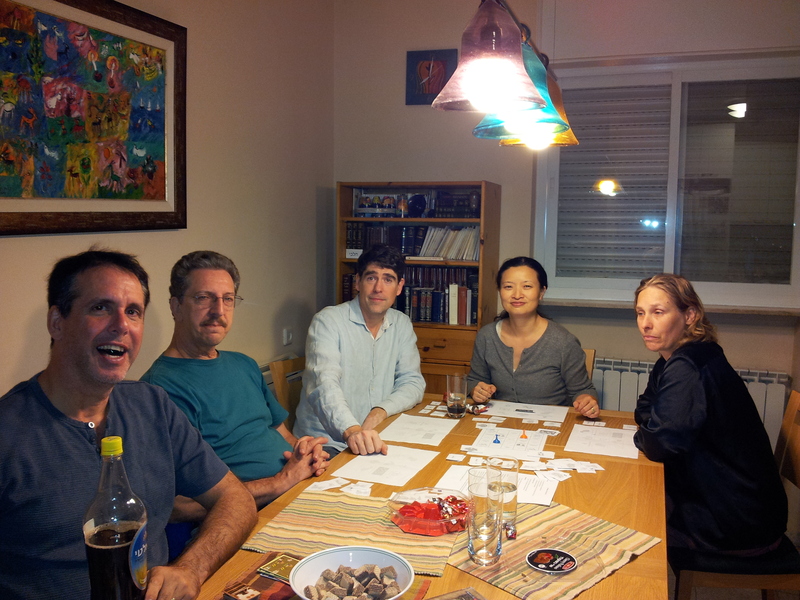 Bill, Shirley, Richard, Nadine, Gili, Mace, Yaakov, Amos. Richard works for Bridges for Peace in the U.S., he’s visiting from Florida. 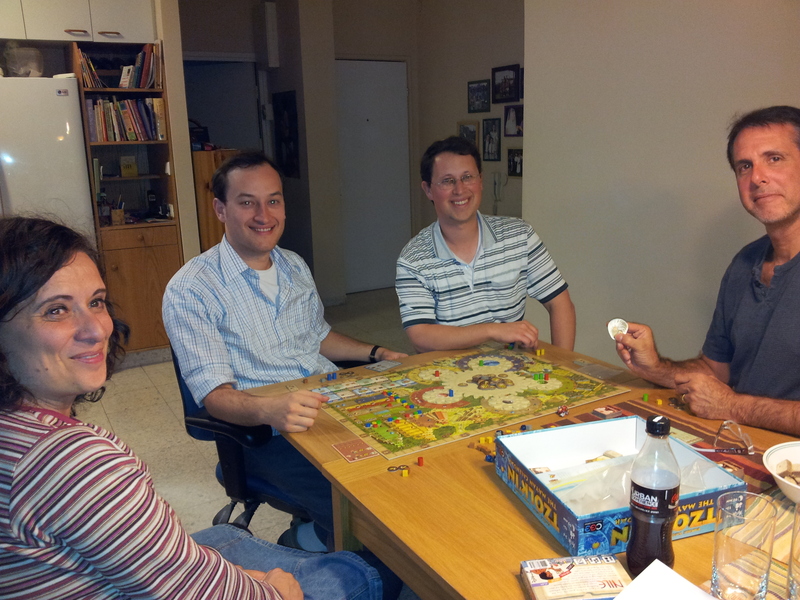 Yaakov and Amos are Hebrew U grad students. Turns out I know Yaakov’s parents in Haifa from LA, and they both know Mace’s oldest son from Gush yeshiva. 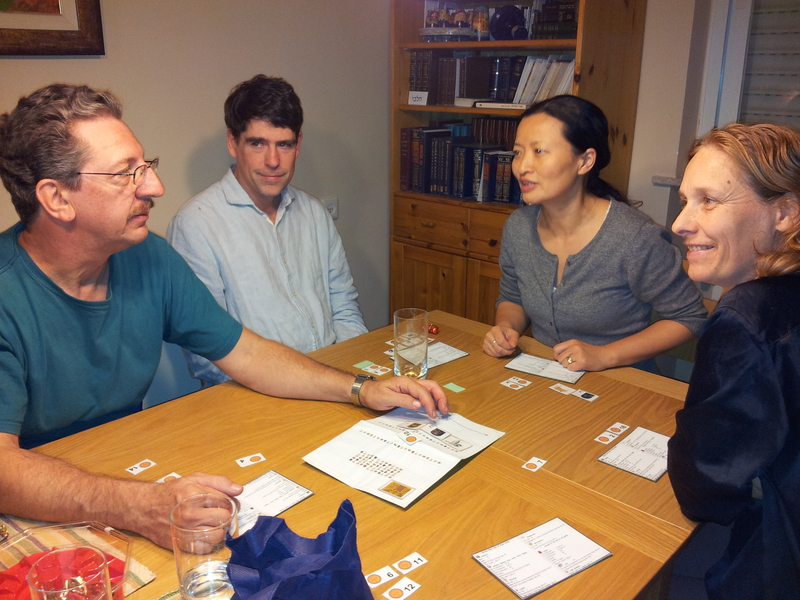 Bill and Shirley suggested this as a good game for introducing Richard to games, he wanted to watch, but did fine. Bill and Shirley said not to keep changing the game, but then made good suggestions. 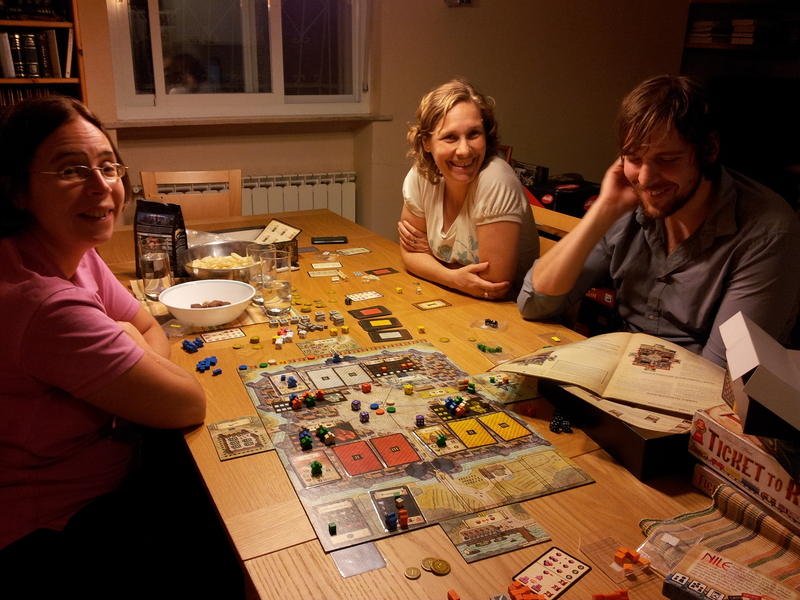 Eszter, Mace and I were playing this while waiting for Yaakov and Amos to arrive, but we didn’t finish due to distractions – Eszter was on the phone, I was helping with the prototype, and Mace was setting up and then teaching Tzolk’in when Yaakov and Amos arrived. I had a lot of harvested cards but didn’t count them. Bill and Shirley wanted a short game because they’re moving tomorrow and need to meet the painter early. First play for Richard, he enjoyed it and said he was glad we made him play. Gili was doing very well and we thought she’d win, but Shirley passed her at the end with the ark and 4 animals. I did terribly with the numbers I had, I got nothing in the first Yovel for -7. Bill did a good job with calling auctions at the right time. He was surprised that I did so poorly and came in last, I wasn’t. 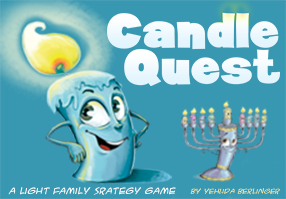 First play for Amos and Yaakov. Mace had around 9 skulls, some leftover for points, but still complained when people blocked him. Eszter was glad to do as well as she did. Mace said he feels good if someone takes longer than he does. On his way out Richard said it looked like Monopoly. I made improvements since playing over Sukkot, but Mace suggested more options and player interaction, though he’s more into confrontation than I am. Mace saved up cards, but started cashing them in too late; he should have won. Mace hadn’t played in a long time, but he caught on to a good strategy, staying the lead the whole game, building a lot and blocking actions we wanted. Eszter had a hard time and lost too many people, partly because she couldn’t build early enough, but she did well on round points. I went last except on the first turn, when I got a dragon. I miscalculated near the end when I forgot that I couldn’t take 3 yuans free again after taking 3 the turn before, and I needed money for taxes and to pay to get the rice action on the following turn. Fortunately I was lucky and the rice action was available the turn before. Mace used books the last two turns so he was in first place. He also had a double dragon, Eszter had a double and single. A dramatic finish – after counting people and multipliers, we were tied. I won due to my 3 yuans that I took on the last turn when nothing else would give points. We all made numerous mistakes and could have done better, though it’s all trade-offs. 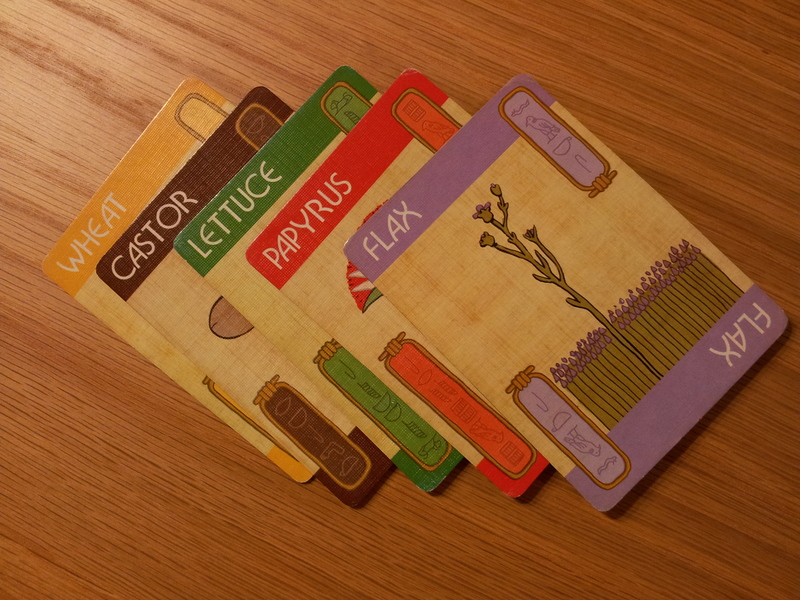 There are more options when you play correctly, we went over the rules to clarify things we’d been playing wrong. But it’s still a lot of luck. Eszter started off strong, harvesting all different cards early. 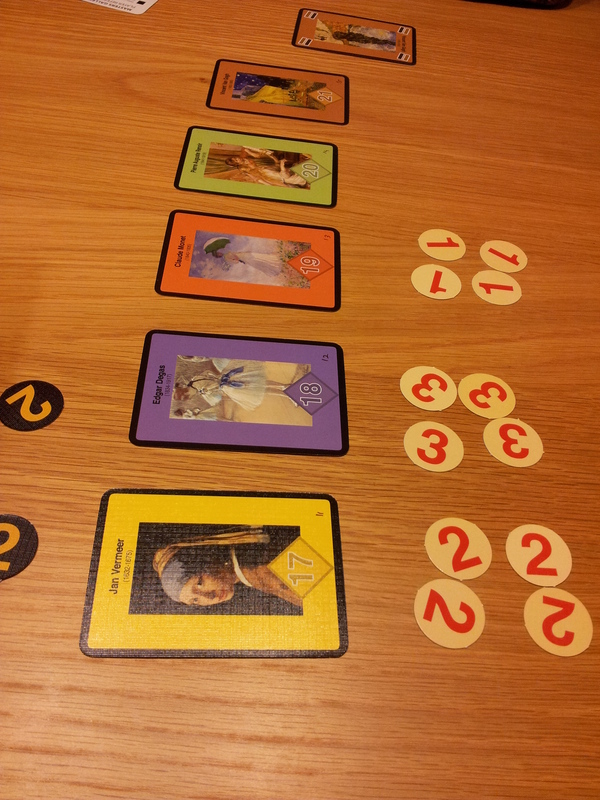 I lost 4 cards to the locusts in the first round, last round we all lost sets of two, Mace lost two sets. Mace had a lot of cards from speculating, I harvested well at the end and caught up with Eszter, though we didn’t expect a tie. Eitan taught Emily the game. We played half a game then stopped because people had to leave. Mace was in a good position with buildings, and Emily and Eitan had tons of resources for monuments. First play for Ori and Sara. They enjoyed playing once they caught on, though Ori didn’t realize that what you have matters even if you don’t have one of each. He had 3 types, Gili and I 4. Ladies of Troyes sounds much better than it is. 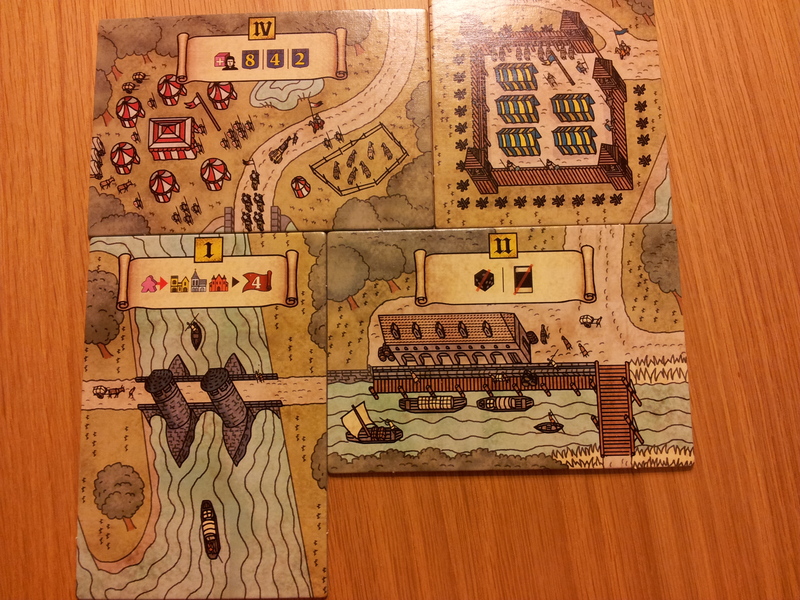 Troyes isn’t a game crying out for extra complexity, not to mention the broken aspects. I like the purple die, you get one each turn and can use it as a joker for any color, including doubling to fight as red, and no one can buy or take it – and most important, it’s a pretty purple. Ladies changes all the cards, and adds extra actions at all the gates – one allows force trading dice with different players. You can easily place six or more cubes on the gate which gives you one white die per turn. Ori placed over 10 cubes there in the last round and kept taking white dice and using them to activate white cards which gave him 3 or 6 points, depending on the roll; he took around 50 points after the rest of us were done. No one could stop him from taking 10 extra turns because of his purple die. He said the game was broken, and suggested fixing it by requiring the purple die to be played if it’s your only die. First play of Troyes for Sara, and this is her second real Eurogame; we may have scared her off, though at least Troyes is open so she could get useful advice. 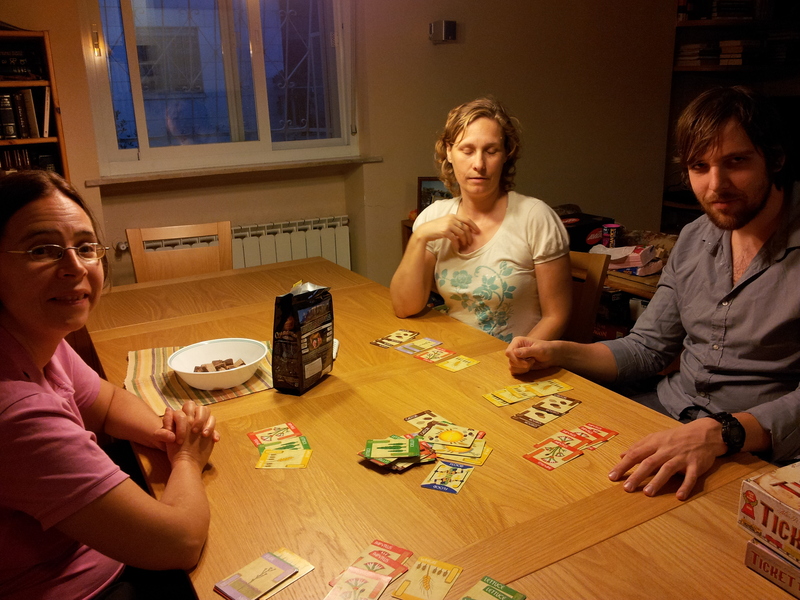 The game took almost 3 hours after Ori explained the game to Sara.